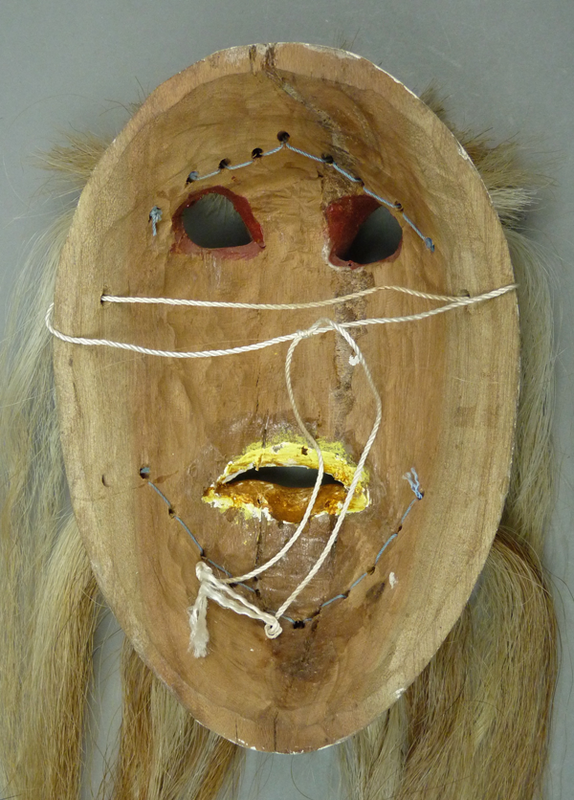 This week we will examine some more human faced masks by Crisencio Molina Maldonado. I will start with one that resembles the child’s mask at the end of last week’s post. 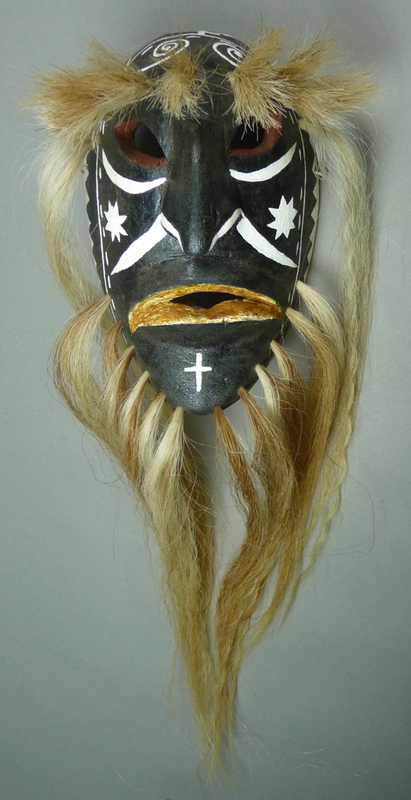 I consider this mask, which Tom Kolaz purchased from the artist for me in 2010, to be a masterpiece. This mask has the brow hair divided into two bundles, while Crisencio usually makes a continuous brow that spans both eyes (a unibrow). 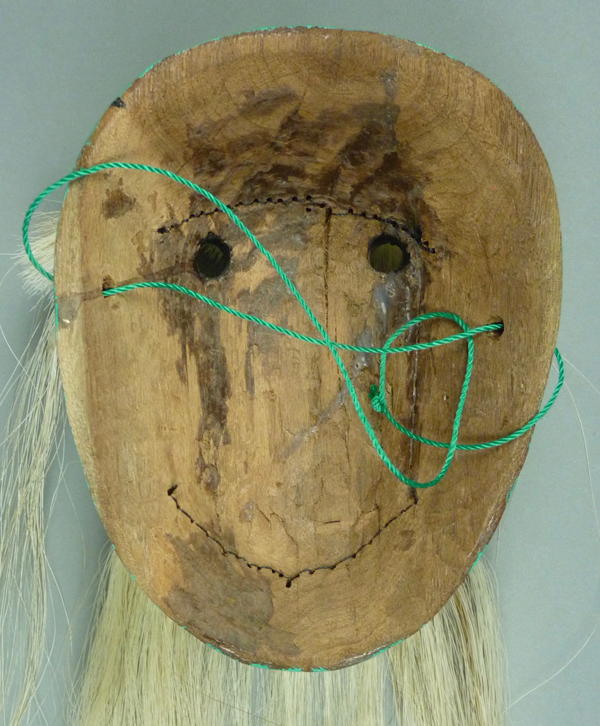 The eyes on this mask are unusual for Crisencio, with round open pupils. The tongue protrudes through a slightly open mouth. The nose, mouth, and chin have all been carefully sculpted. The forehead cross is a simple Maltese form. There is no chin cross. 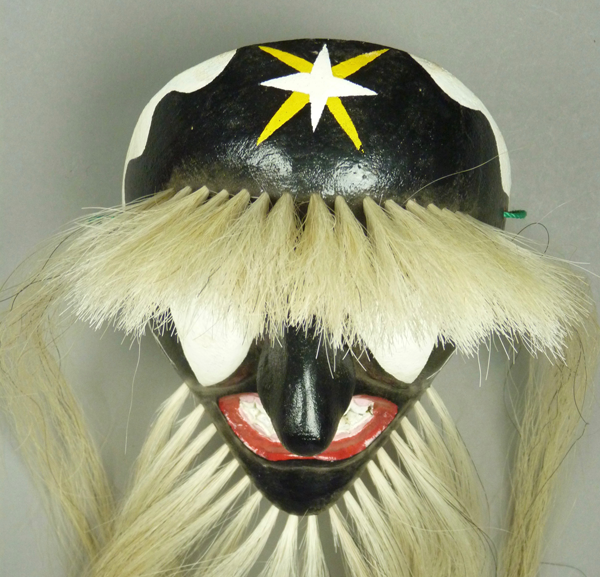 This mask is 7½ inches tall, 5¾ inches wide, and 4 inches deep. 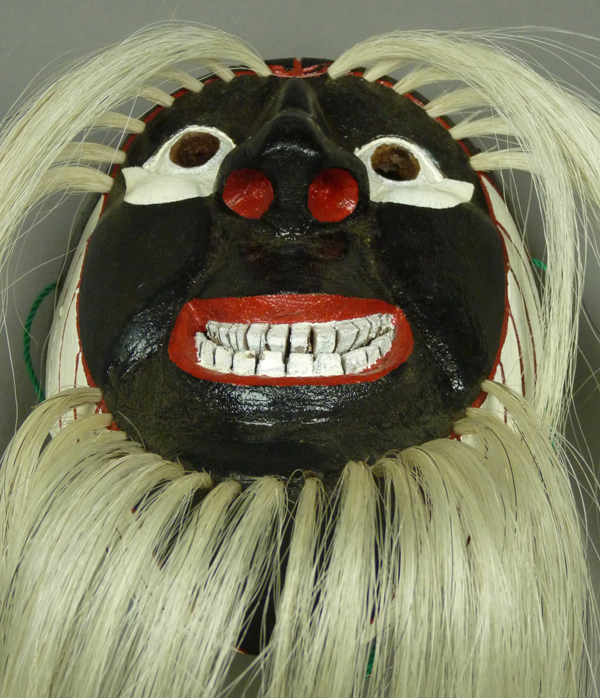 There is no evidence that this mask was ever danced. 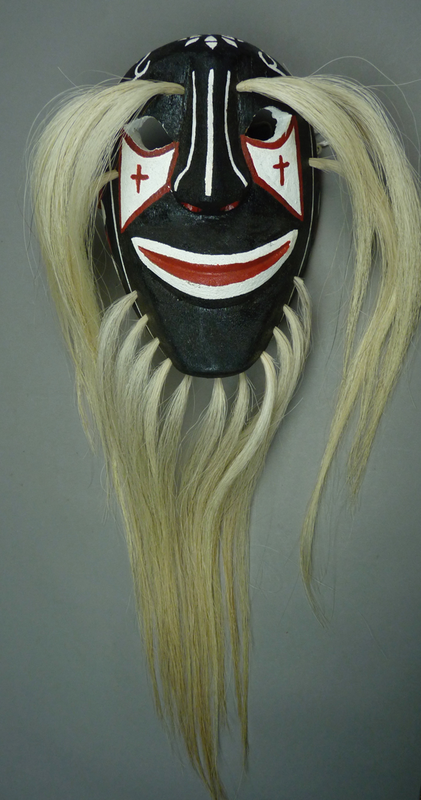 The second mask has several unusual features. To begin with, the gums of the teeth are carefully carved in relief. This one dates to about 2013. 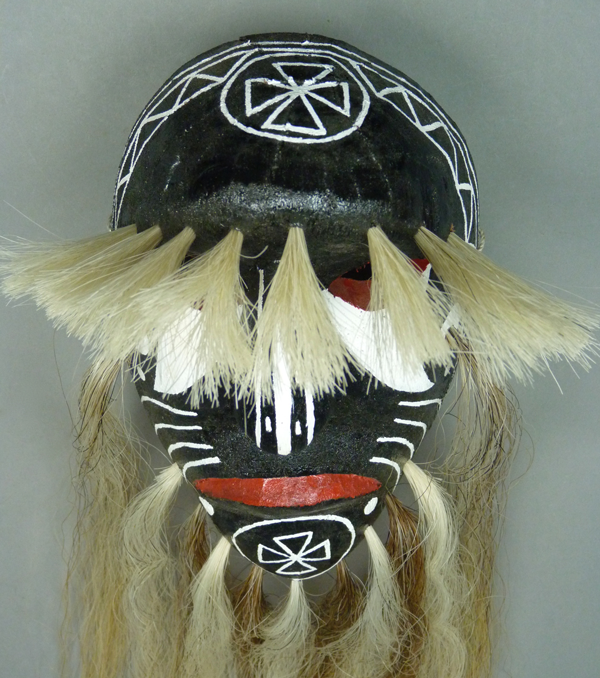 From the side, one notices that the nose on this mask is unusually long. There is a very attractive forehead cross. The general design is like that of one of last week’s masks, but the use of two colors reveals that this is Venus, the Morning Star, with yellow rays of light. The rim design is graceful. There is no chin cross. Note the quality of the hair. 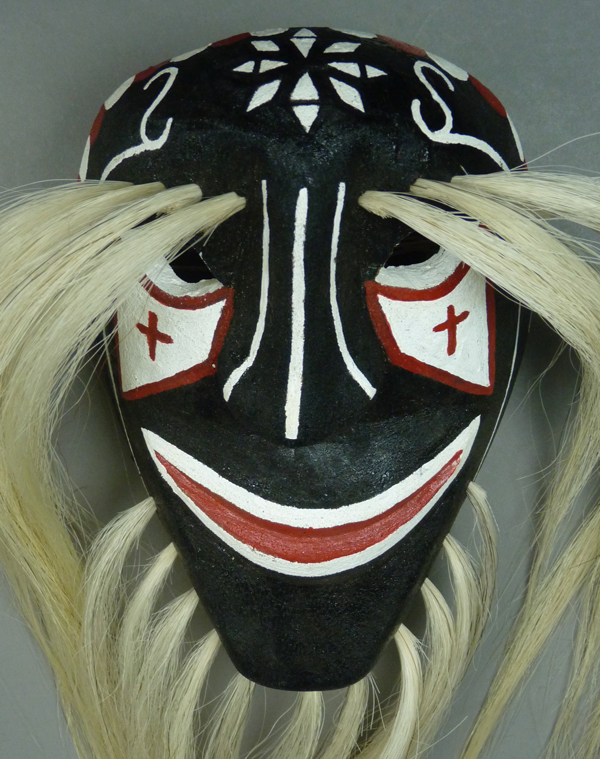 This mask is 7¾ inches tall, 5¾ inches wide, and 3¾ inches deep. 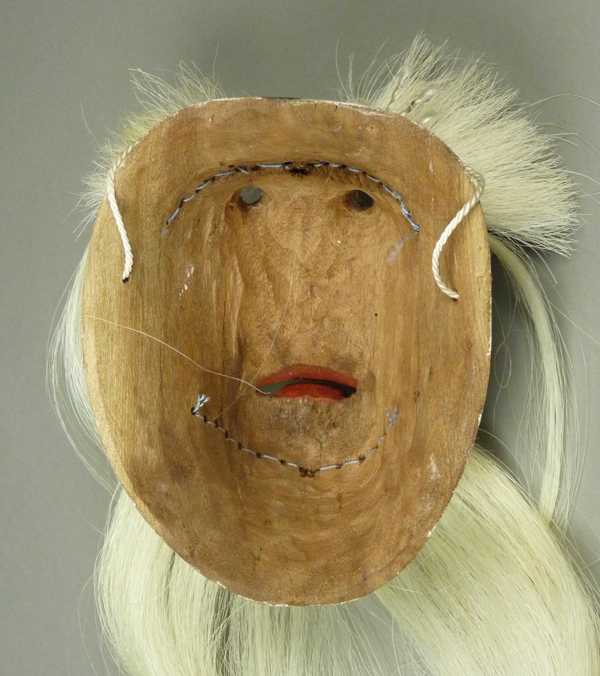 This mask was never danced, but the dark color of the cottonwood root suggests otherwise. 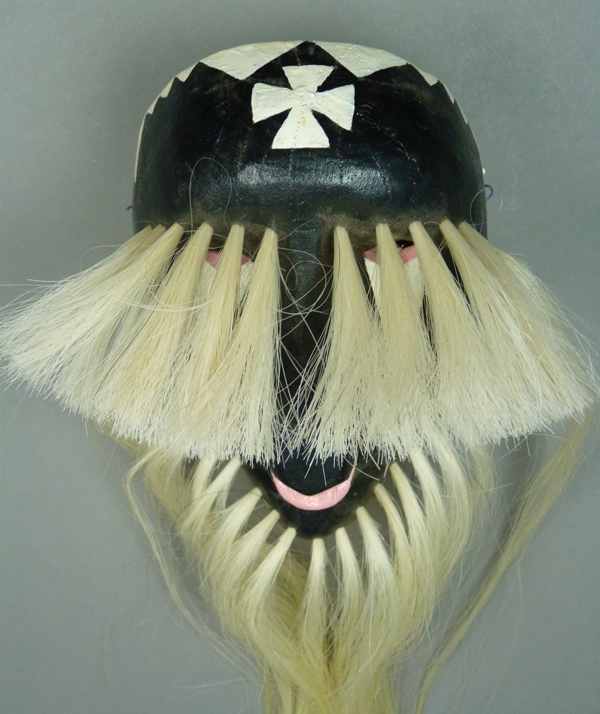 The third mask had been made by Crisencio in 2013 to the order of a particular dancer, but then that individual failed to follow through on the purchase. This manner of carving the tongue between the teeth, which is unusual for Crisencio’s masks, is a favorite feature of Mayo carvers. Green leaves are a symbol of the Sea Ania, the Yaqui’s sacred flower world, so the green paint for the rim design and cross might also be a reference to flowers. In fact, the painted lizards, insects, and flowers on the cheeks of Pascola masks are all likely to be references to the Yaqui sacred worlds. 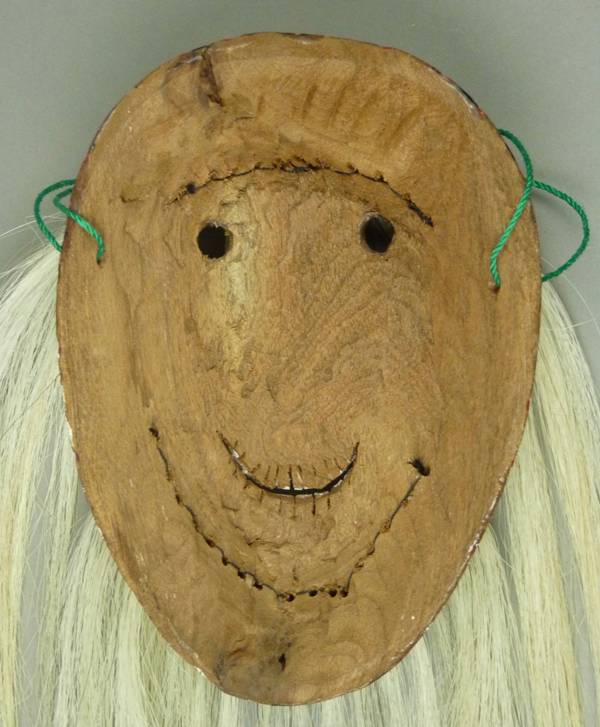 This is another Crisencio mask that has wonderful hair. 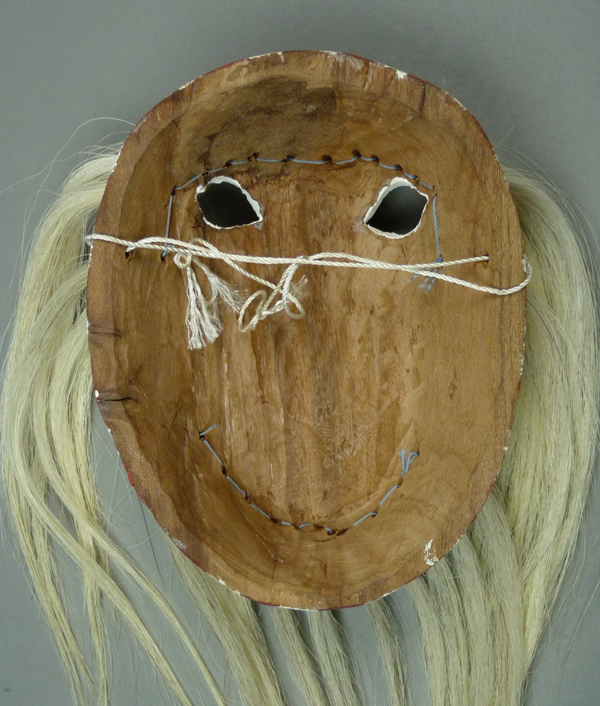 This mask is 8 inches tall, 6 inches wide, and 3½ inches deep. 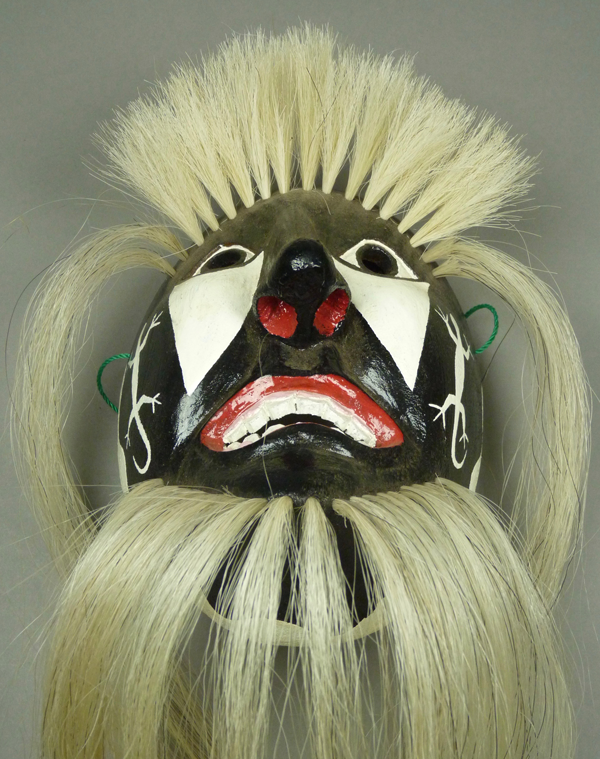 Unfortunately this mask was deliberately carved for a dancer, but never danced. 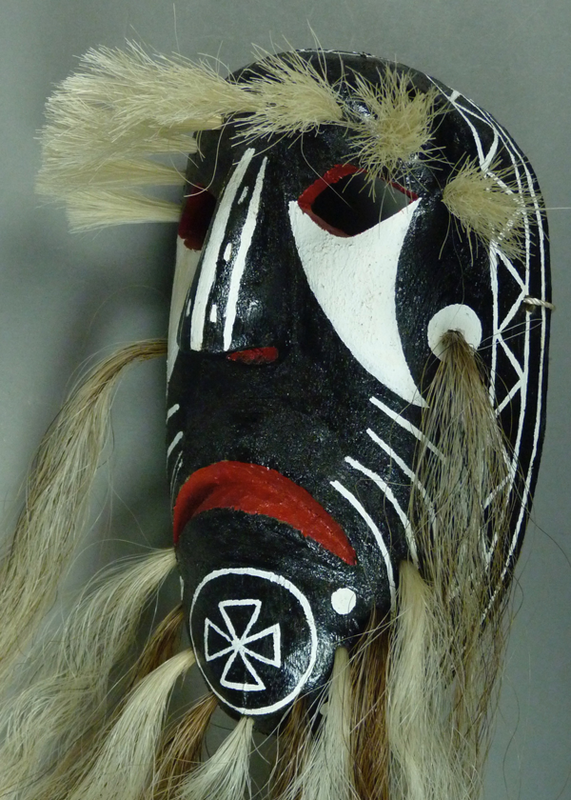 The fourth mask, dating from February 2014, has an unusual appearance, and I wondered whether it was meant to portray a monkey. Tom Kolaz asked Crisencio about this, and Crisencio said that it is not a monkey. Then does it represent a human, Tom asked, and why doesn’t it have a cross? It lacks a cross, explained Crisencio, because it represents an animal from the Yoania (one of the Yaqui sacred worlds or realms) that is in the process of becoming human (or something to that effect). Crisencio visits this parallel world through meditation or trance, and in such a visit he evidently saw this creature. 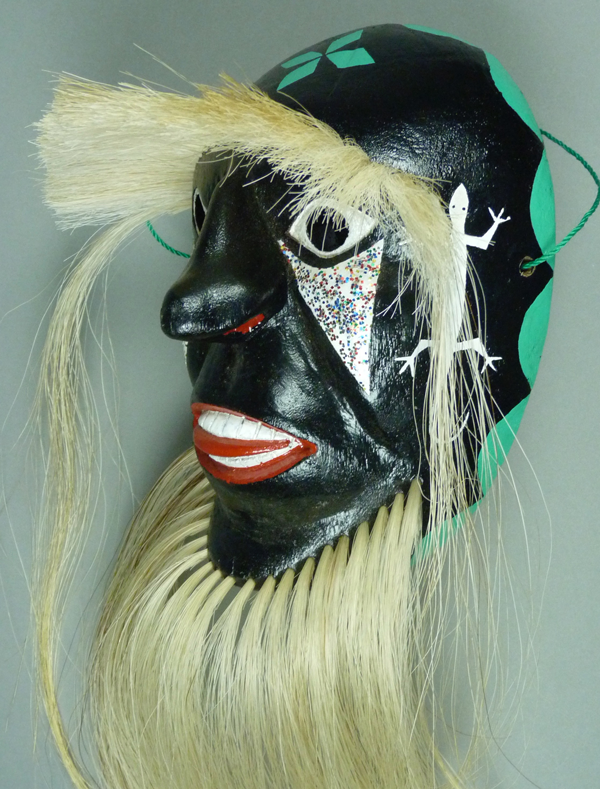 I have never seen any other Yaqui Pascola mask that looks like this one. 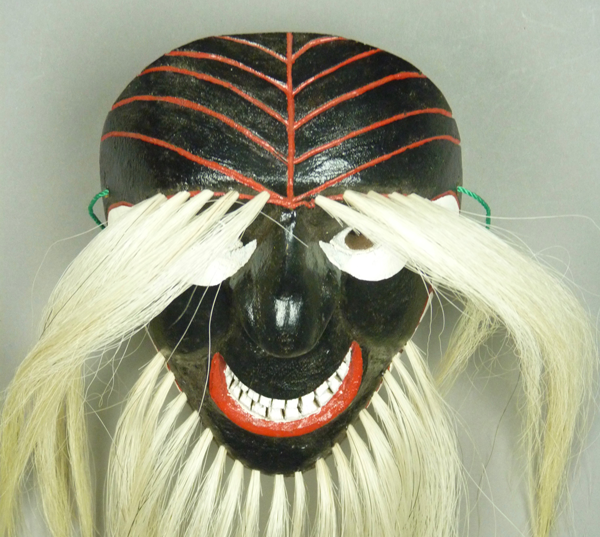 This mask is 7¼ inches tall, 5¼ inches wide, and 3½ inches deep. Again, this mask was never danced. 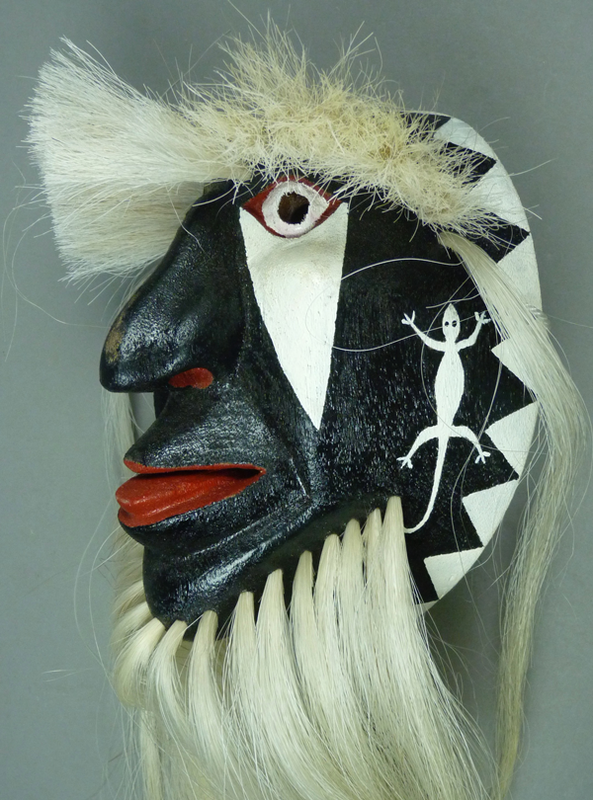 The fifth mask is a copy by Crisencio of a mask that is depicted in a book—Potam: A Yaqui Village in Sonora, by Edward H. Spicer (1954. Figure 7 after page 220). 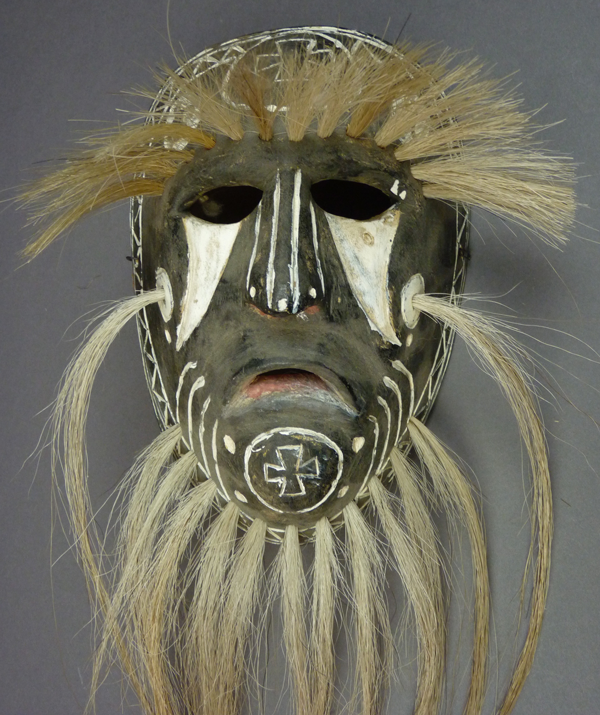 Both this mask and the original have remarkable snouted mouths. Also note the elegant rim design on this mask, one we have seen before on Rodríguez masks. 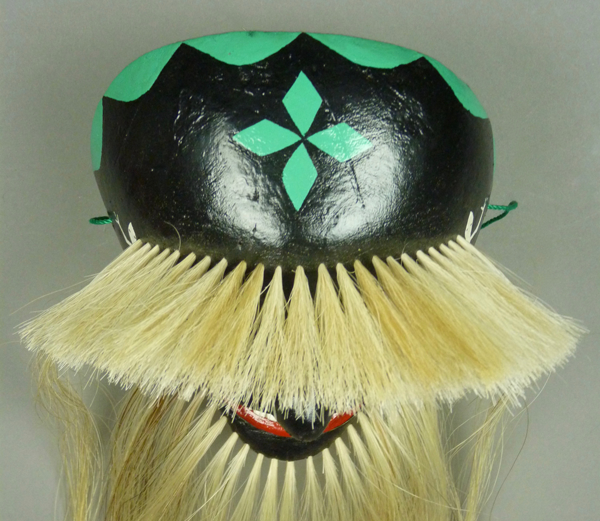 There are fewer hair bundles on this mask, in comparison to others by Crisencio, but the bundles (of horsetail) are unusually thick. There is no chin cross. 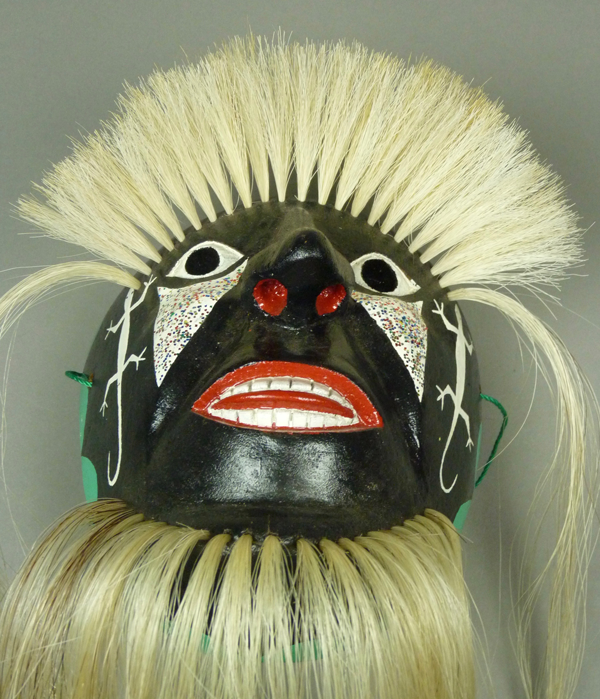 This mask is 8½ inches tall, 5 inches wide, and 3½ inches deep. This is another well-carved but unstained back. 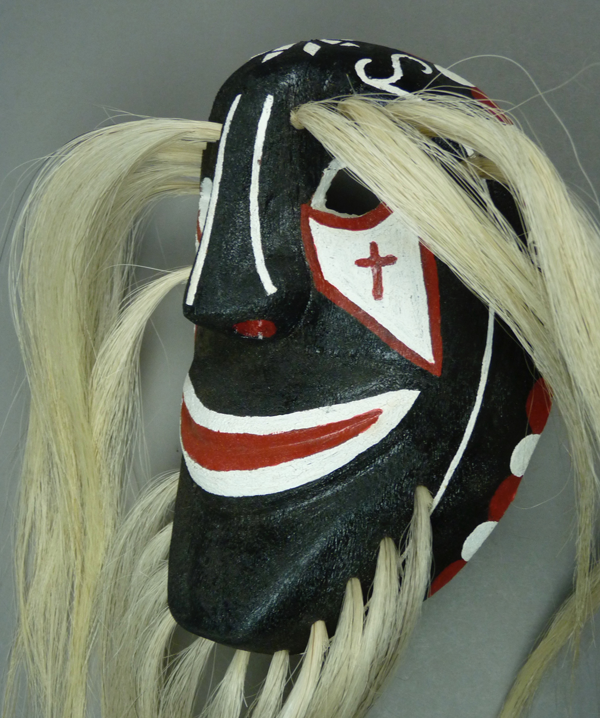 This next mask is a copy by Crisencio of a mask he saw in a dance photo. 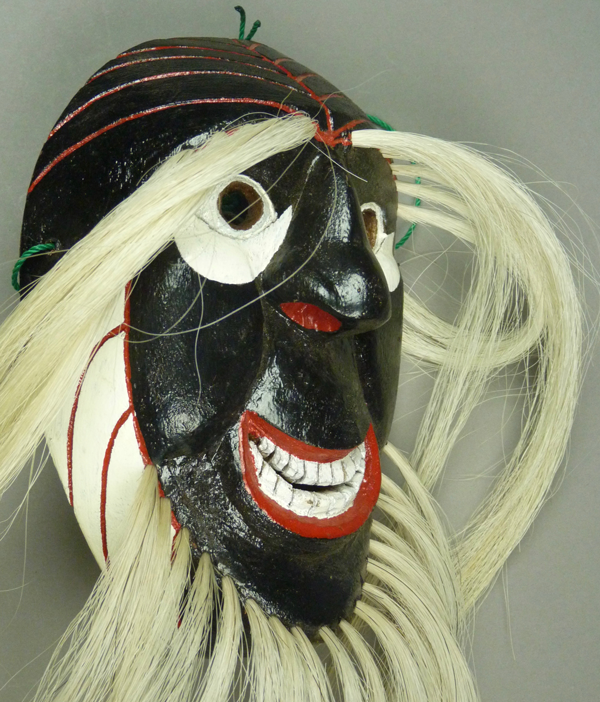 Ironically, although that mask was carved by a Mayo artist, Saturnino Valenzuela, it was probably an imitation of an older Yaqui mask, as Yaqui masks have this long shape, while Mayo masks are more oval and compact. 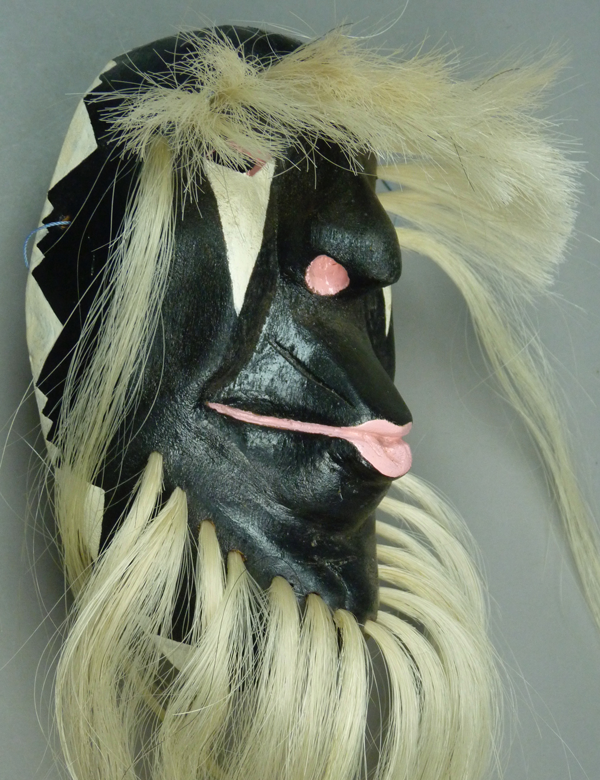 Except for the mouth design, one would never guess that this mask was carved by Crisencio. The original did have such a complex forehead cross. 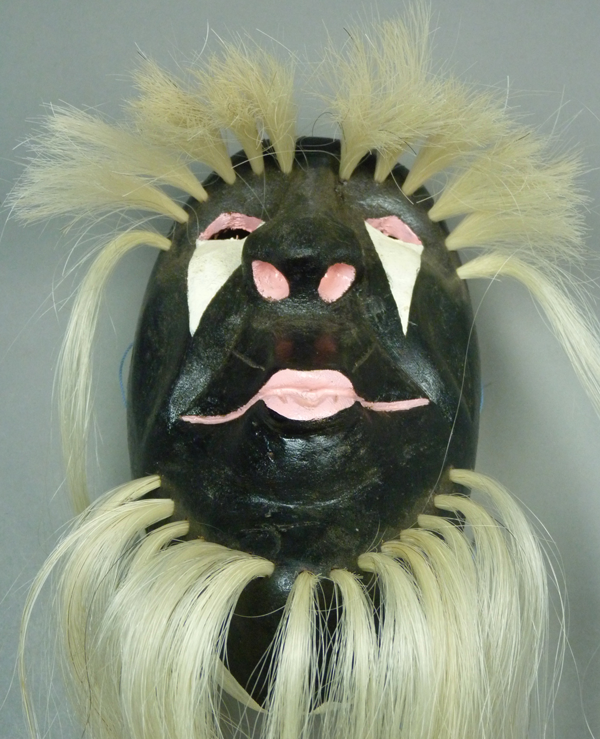 This mask is 8 inches tall, 6 inches wide, and 3 inches deep. The undanced back has the natural color of Raiz de Alamo (cottonwood root). 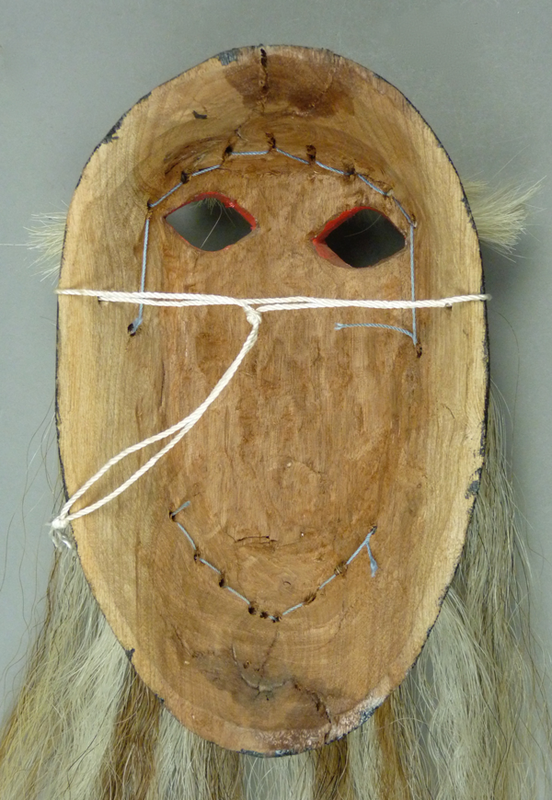 The seventh mask in this post copies features from several old Yaqui masks that Crisencio saw in photos. 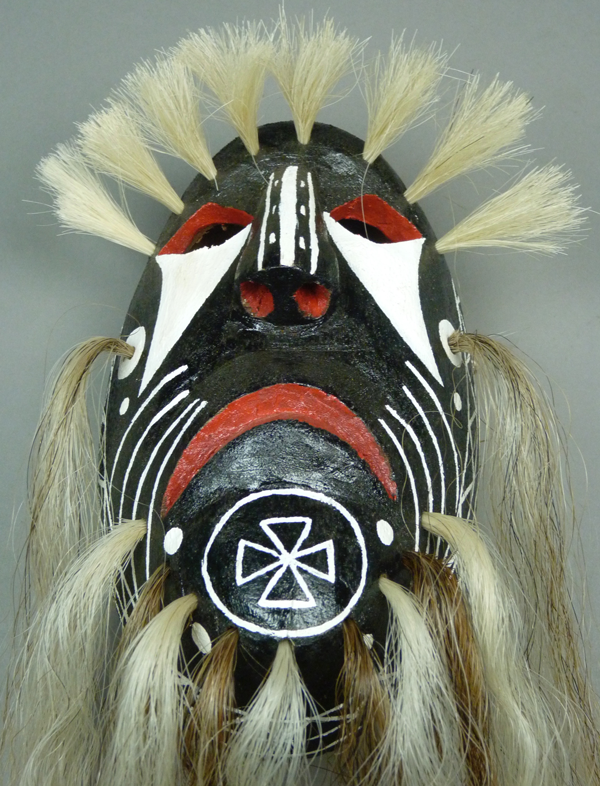 The frowning mouth, for example, was a feature found on masks from the early 20th century. 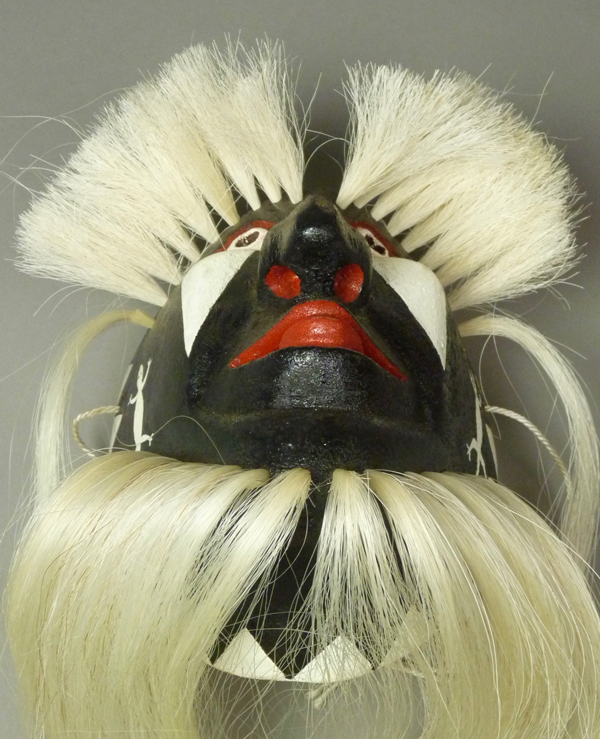 The curling spirals on the forehead copy those an an early 20th century Yaqui mask in the Smithsonian Museum. Yaqui Pascola masks often have these graceful elegant noses, and this nose reminds us that Crisencio is a skilled carver. 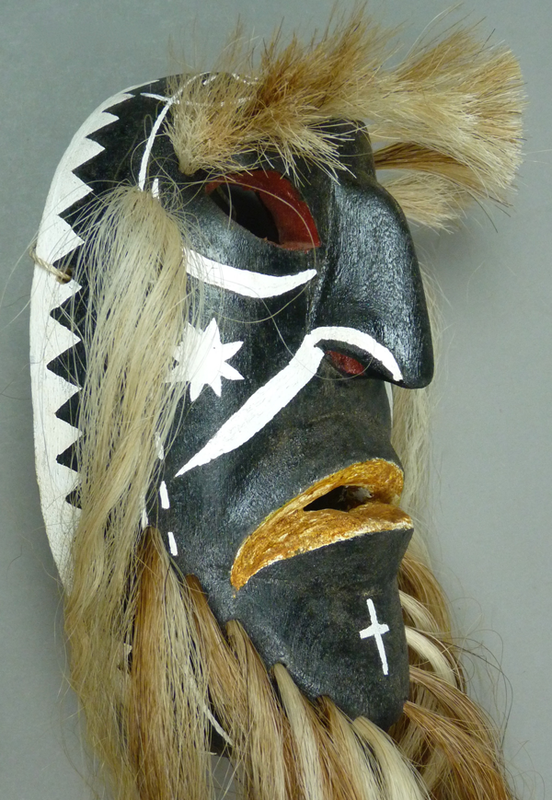 This mask has very simple Christian crosses on the forehead and chin. 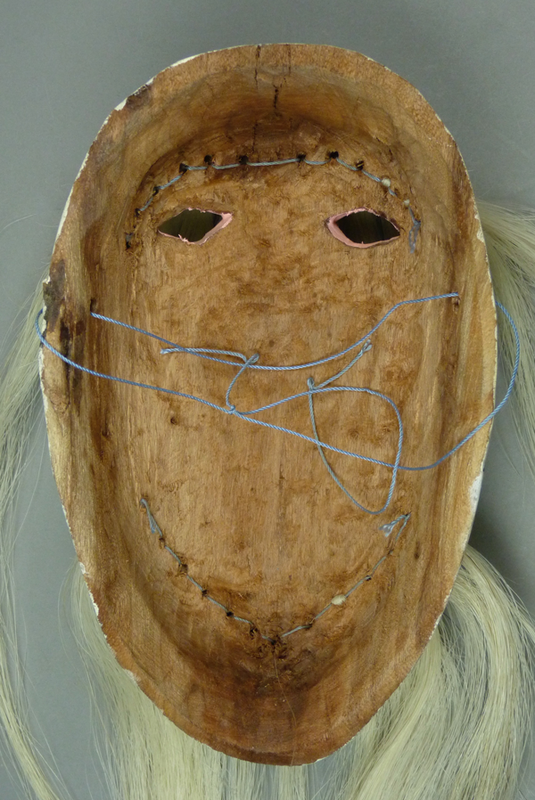 This mask is 8½ inches tall, 5½ inches wide, and 3¼ inches deep. There is no evidence of use. The last mask in this series is a copy of a copy. 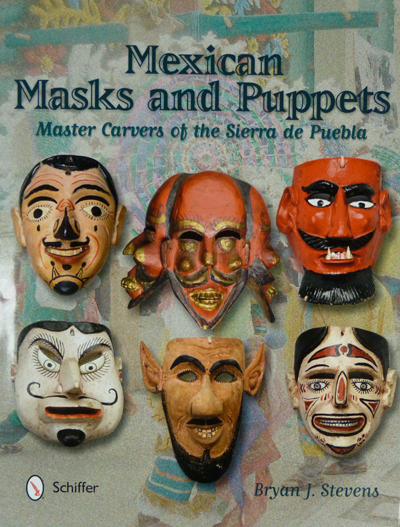 The original, which is illustrated in “Old Men of the Fiesta,” by James S. Griffith and Felipe Molina (figure 21 on page 29, and in a group photo that is opposite the Table of Contents), is a one hundred year old mask from the collection of the Heard Museum. 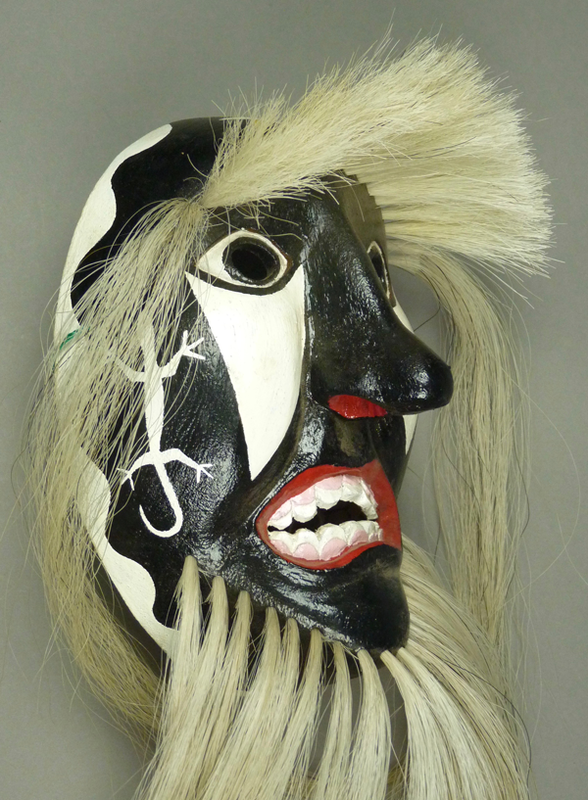 Saturnino Valenzuela (a Mayo carver) had made a copy of this mask, and Crisencio copied Saturnino’s version. Here is the copy by Saturnino. Note the crescent shaped frown. 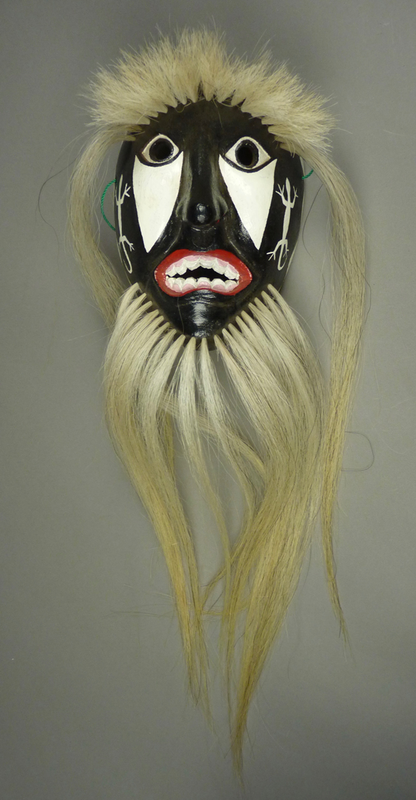 I photographed this mask with the kind permission of Jerry Collings, at a time when it was in his collection. And here is the copy of Saturnino’s copy that was made by Crisencio. These crosses within circular frames were an attractive feature of the original model for these copies. Crisencio is an excellent freehand painter. 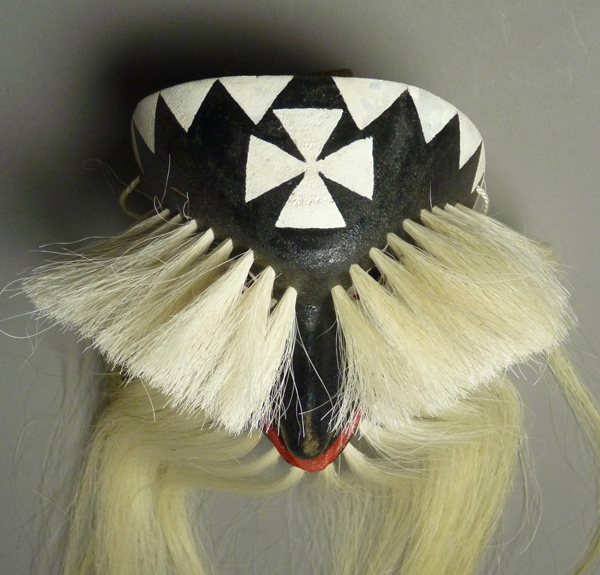 This design of dashed lines enclosed by solid lines is found on several late 19th century Yaqui masks in museum collections. 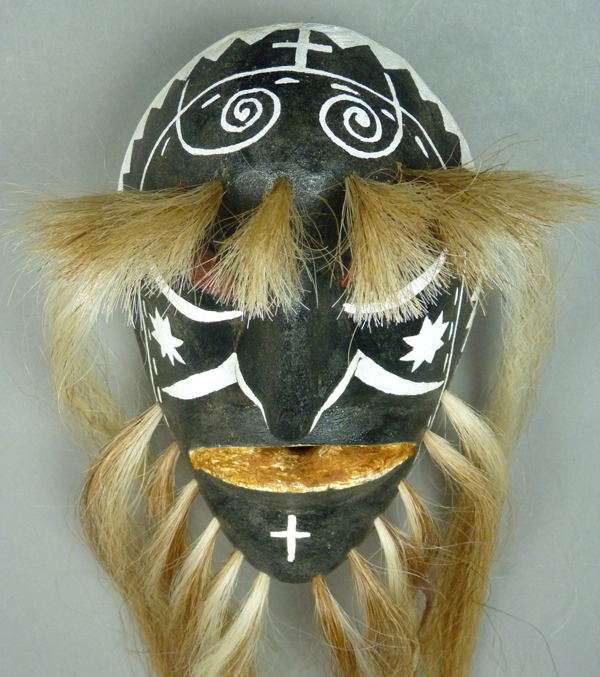 This mask is 8¼ inches tall, 5 inches wide, and 3 inches deep. The undanced back of the double copy. 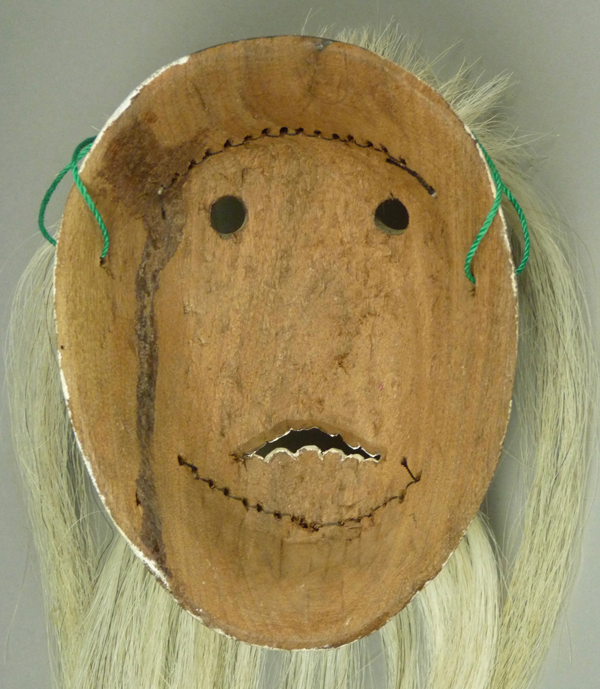 Next week we will examine human faced masks by Crisencio that have brown faces. 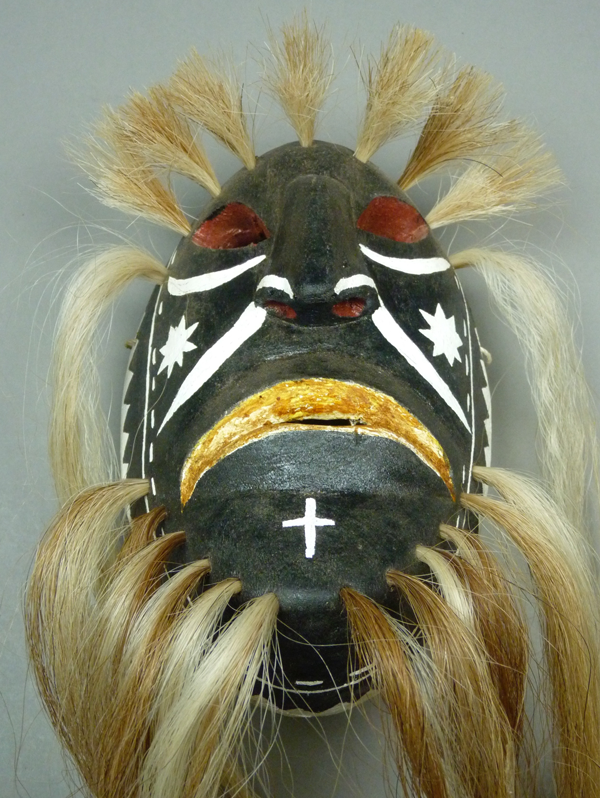 Wow, you have some great masks, and thank you for posting this…I am just learning about these masks. I am glad that you like them. I certainly do!